Let me say it now that I’m not proud of any of the city shots I took of Djibouti but I promise to fix this when I go back! These two pictures above and below were some of my first views of the country taken from my hotel rooftop the day I arrived. 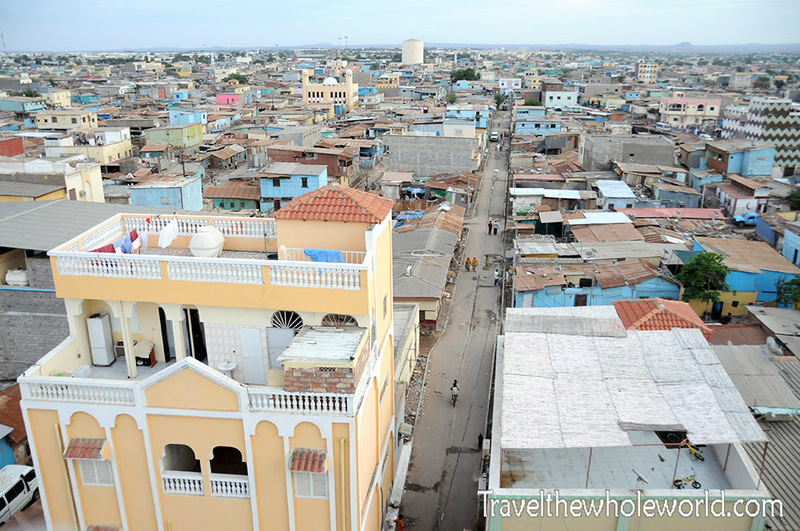 This is Djibouti City, the capital of the country with a population of about 620,000 people. Keep in mind the entire country only has 900,000 people, so two thirds of the population live right here! The two photos above are pretty close to the city center. 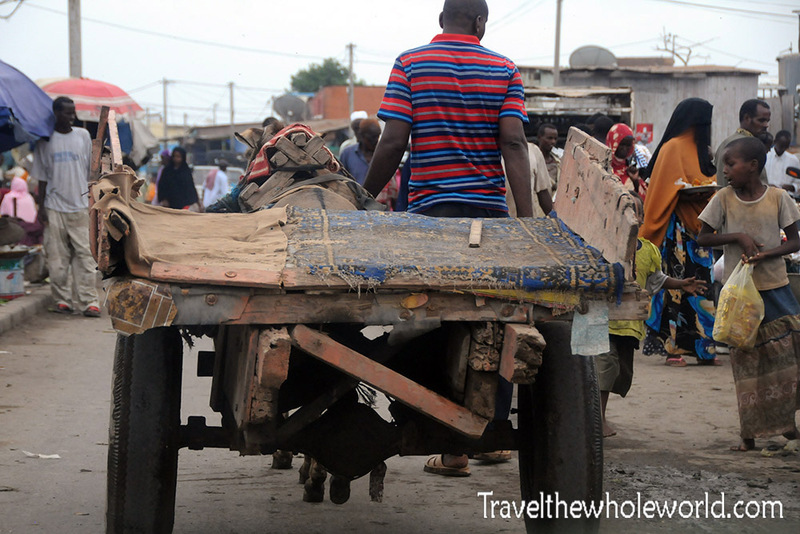 It’s fairly easy to get around in Djibouti. If you walk through the city you’ll be offered a taxi about every five minutes. If you decide to take one they are reasonably priced. 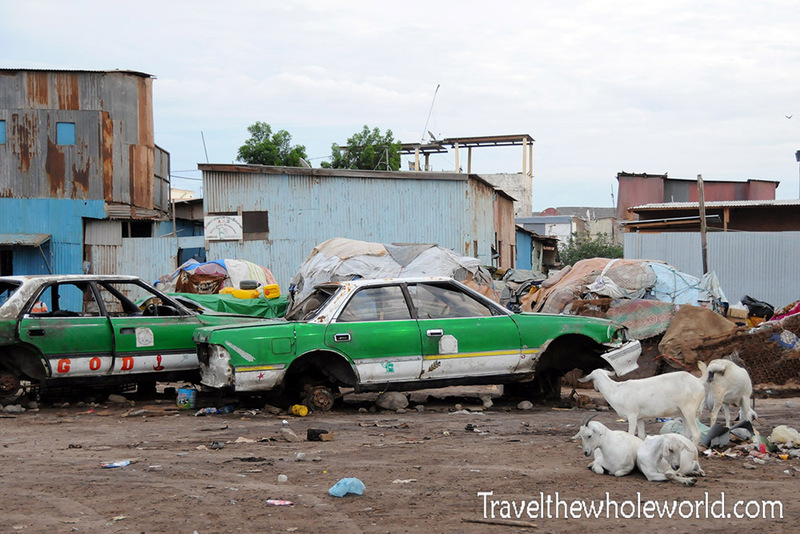 Second to taxis in Djibouti are Khat stands. On the left are some vendors selling the natural leaf that people chew in order to get an effect similar to high amounts of caffeine. I view Khat as the African version of South America’s cocoa leaves. 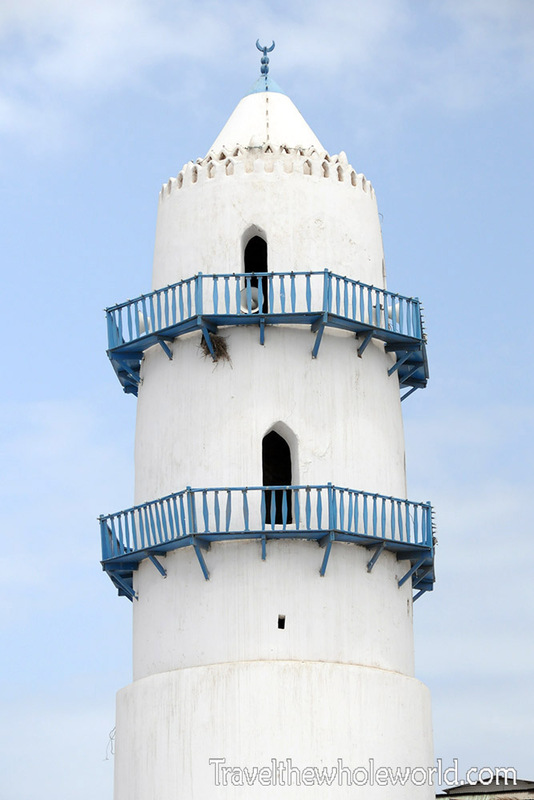 For better or worse it has a very strong cultural presence in Djibouti as well as its neighbors. I asked if I could take the above photo and all these guys encouraged me except for one rebel. 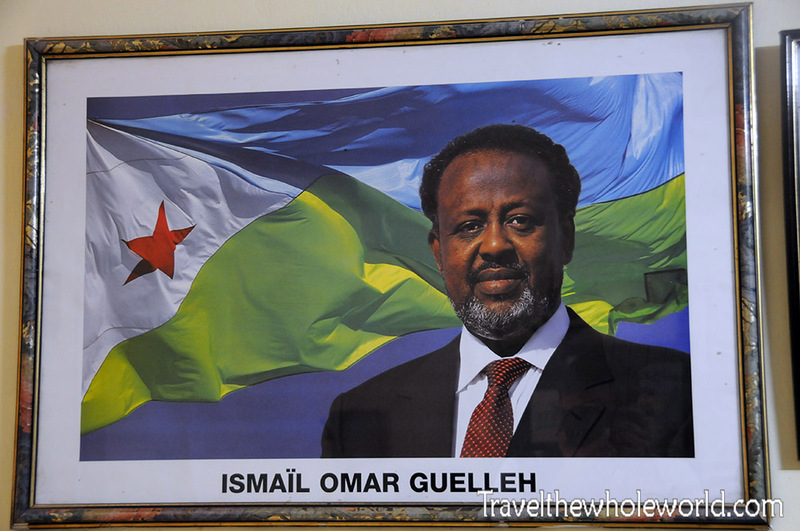 When I was in Djibouti Ismail Omar Guelleh was the current president of the country. Like many other Islamic countries that I have traveled to, I frequently saw the leader’s portrait displayed in government buildings and shops around the capital. The president practices Sunni Islam as does over 90% of the rest of the country. I didn’t go inside any of the main mosques, but I did take some photographs of some of the minarets I saw. This one above was my favorite because I thought it sort of resembled a light house. Although the country is majority Muslim they are religiously tolerant and you will also find a church every so often. 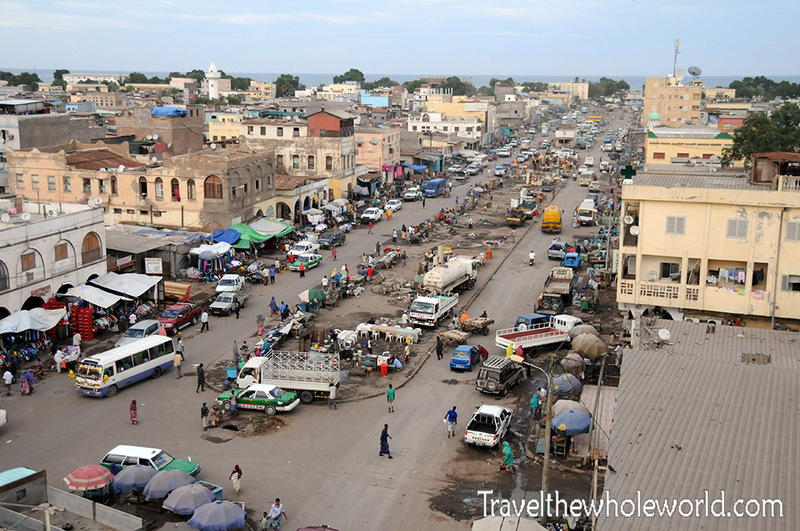 Above is a photo of the city market located in the African Quarters. 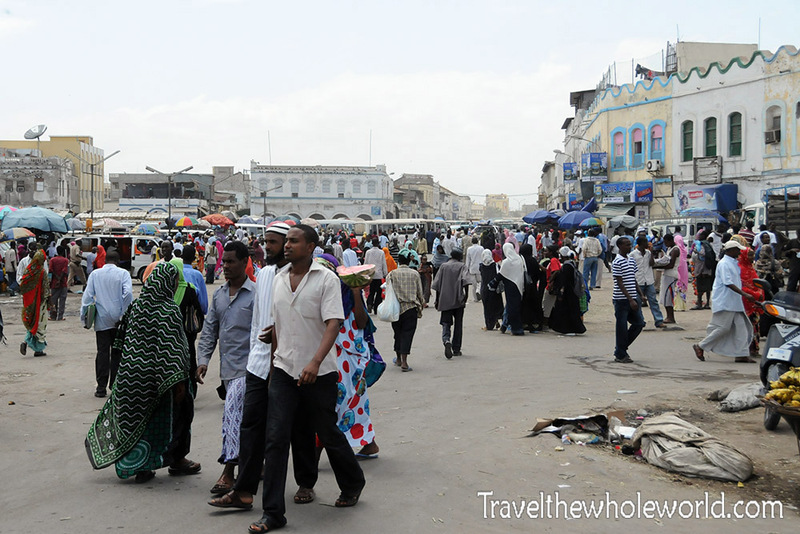 I walked around most of Djibouti and often crossed through this intersection while going to different places. Most times there was a large food market going on until the sun began to set. I didn’t really hang out here because I always was on my way to a destination, but from all the times I passed through I could tell it was a great place to people watch. These kids are two who I tried to talk to in the market. 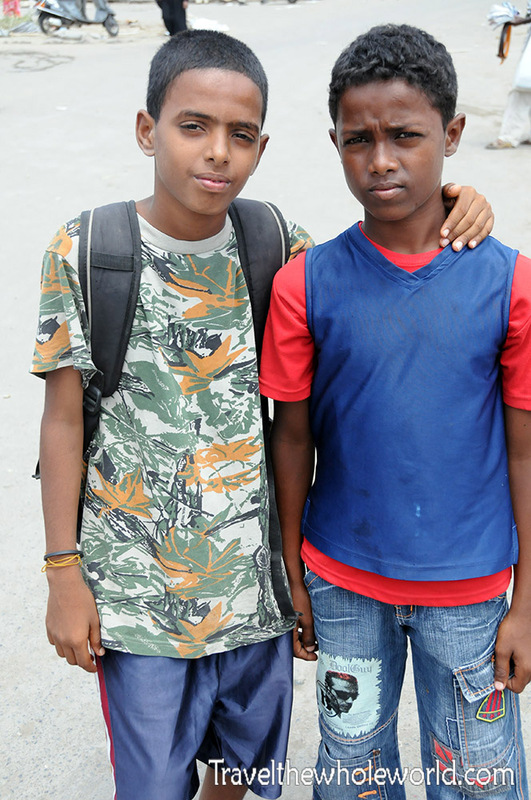 They are both natives to Djibouti but the kid on the left is definitely much lighter than most people here. 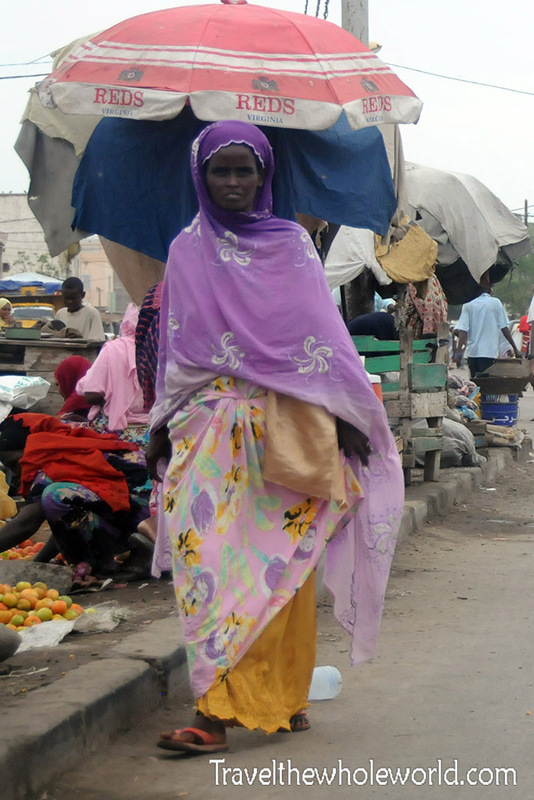 Djibouti has a large mix of Arabs, Somalis and other local races. 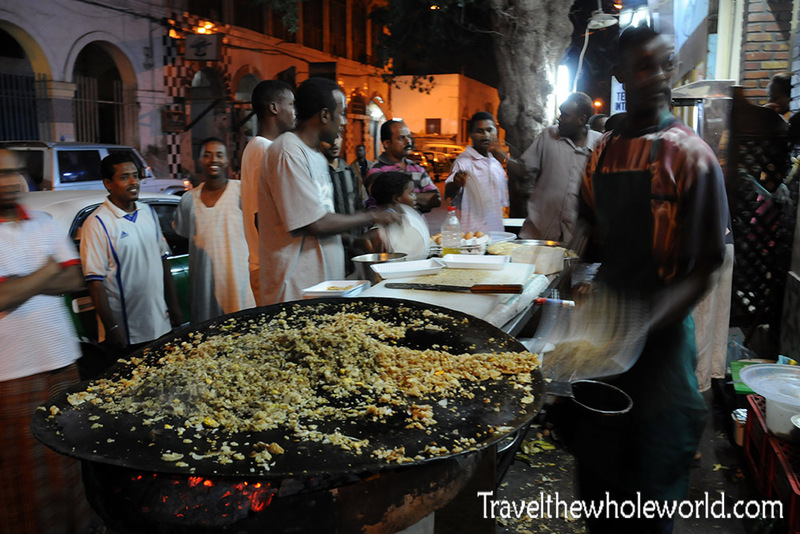 The mix of ethnic groups in Djibouti gives a diversity of culture and food. ‘m not sure what they were cooking in the photo below, but by the small card this guy’s restaurant seemed to be pretty popular! 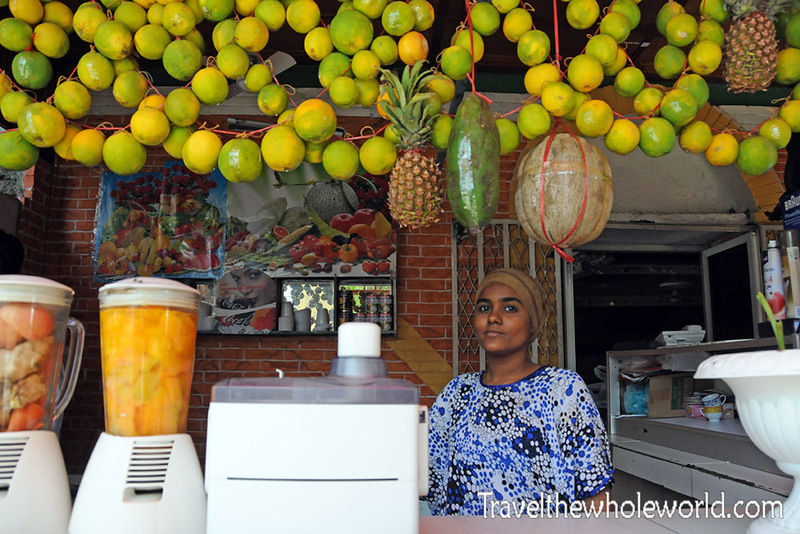 I pretty much went somewhere new everyday for food but this juice bar was amazing. It was on such a dusty dirty road that to be honest I was a bit reserved about having a drink from here, but the inside was clean and well taken care of. The owner was from Yemen and always came out to shake my hand when I came by. I seriously went almost every day I was in Djibouti! 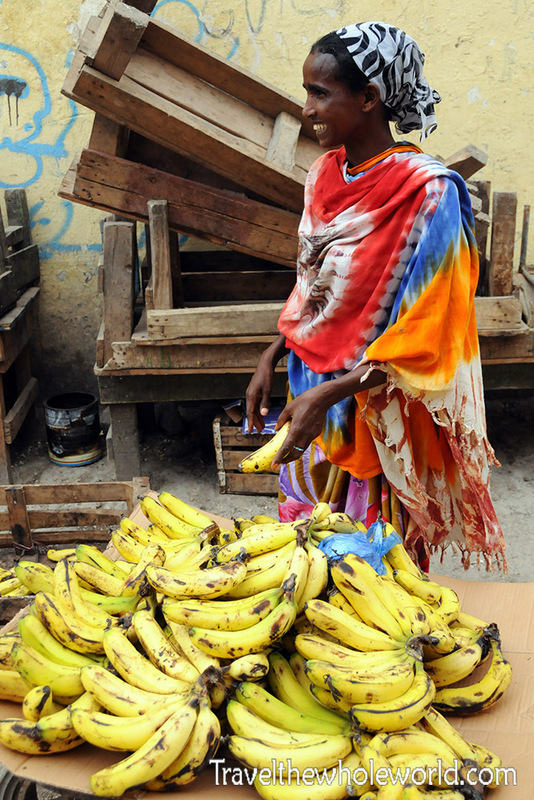 Below is one last photo from some of the markets; maybe the juice bar got their bananas from her. I somehow ended up walking through some of the random neighborhoods in Djibouti. The area was quite poor, which was a bit of a surprise to me. I figured that since France’s largest military base was here among other international expats there’d be enough extra cash for the entire city to benefit. Although I suppose that rarely happens in third world countries so what was I thinking! 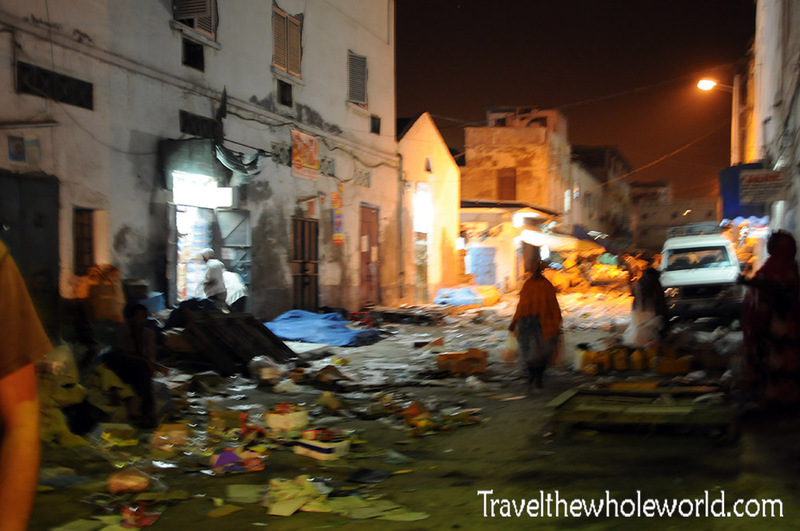 While I never like pointing out negative observations about any country, I have to admit that Djibouti’s African quarters had some of the trashiest streets I had seen in the continent. Above are below were two shots I took while exploring the city. I later learned that poverty levels in Djibouti are incredibly high, roughly 50%. 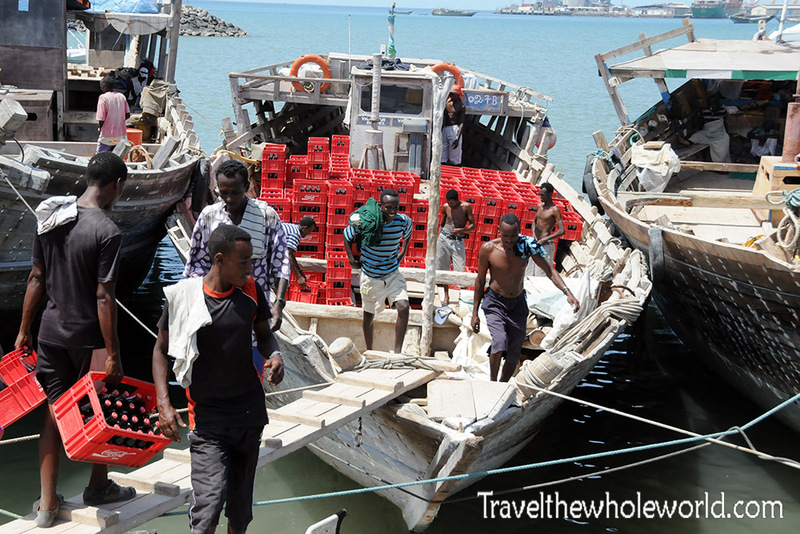 On the positive side Djibouti has one of the lowest crime rates in Africa and a very friendly population. Taking a drastic change in culture, visiting the European Quarters from the African ones makes you feel as if you’ve left the country. It’s a pretty common theme in third world countries, having large swathes extreme poverty alongside wealth all in the same city. This photo above shows some newer looking vehicles parked along a popular strip tat has several bars and restaurants, and even a few clubs like this one below. Djibouti City’s European Quarters isn’t just a collection of a few bars. There are actually people actively roaming the streets and trying hard to get you to go to their establishment. 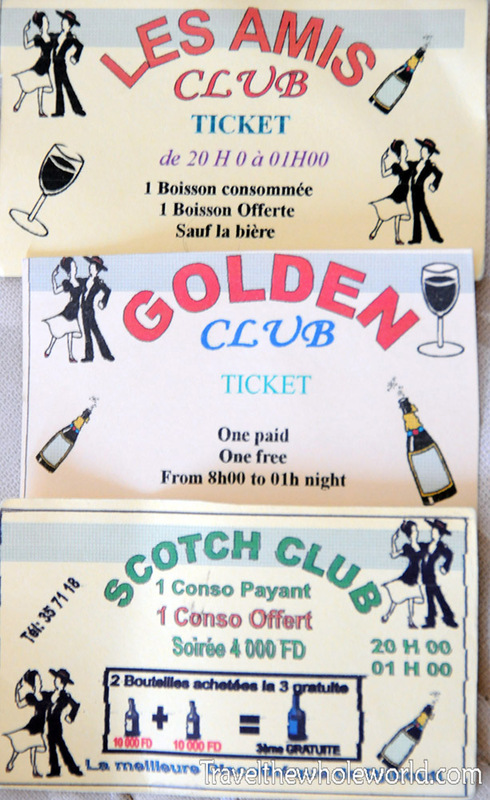 After walking around with a friend I met while traveling, we were constantly being approached and handed out cards advertising different clubs. Above is a shot of three of the cards I was given. These are all different establishments but they all have a similar design. 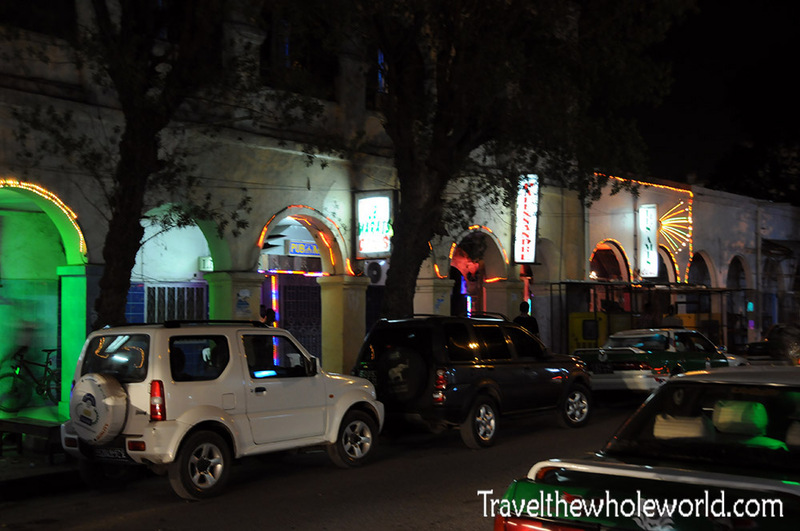 No one would travel from a western country to Djibouti for the purpose of night life, but if you’ve been working or living in one of the surrounding dry conservative countries Djibouti can offer a good escape. While I never have been into clubs, I did at least go out and have a beer at the end of the night with my Swiss friend that I had met. Pretty much everything is available here in terms of alcohol and night life. 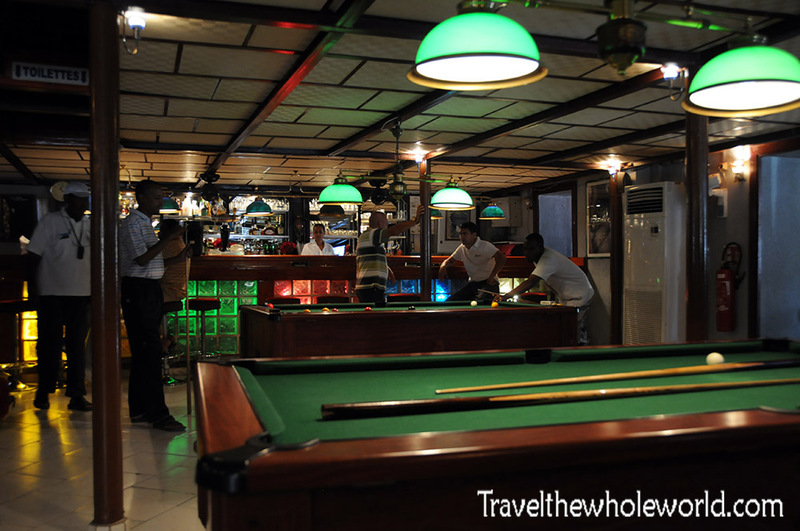 The photo below shows some pool tables in one of the bars we went to. In the European Quarters the locals are much more ambitious and will approach you just for a quick chat. A random man went up to the Swiss guy I was with and began to praise Christianity. They both spoke in French so I was left out of the conversation, but after the man left the Swiss guy explained to me what happened. The Swiss guy looks Jewish so he pretended to be Christian as he does when traveling to these parts of the world. Between the European and African quarters there is a wide range of places to stay. I choose the African quarters since it was much cheaper. 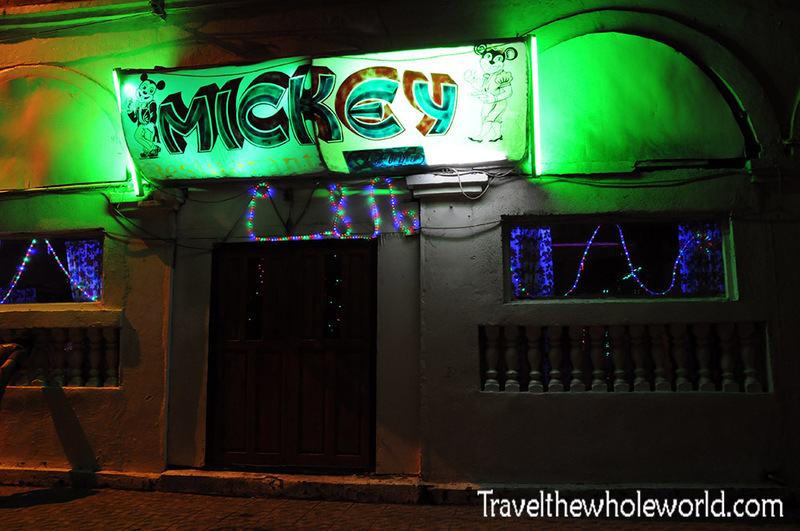 I actually got the cheapest place I could find so my accommodation was pretty humble in while staying in Djibouti. I woke up one morning to find my bed covered in baby roaches… Gross! 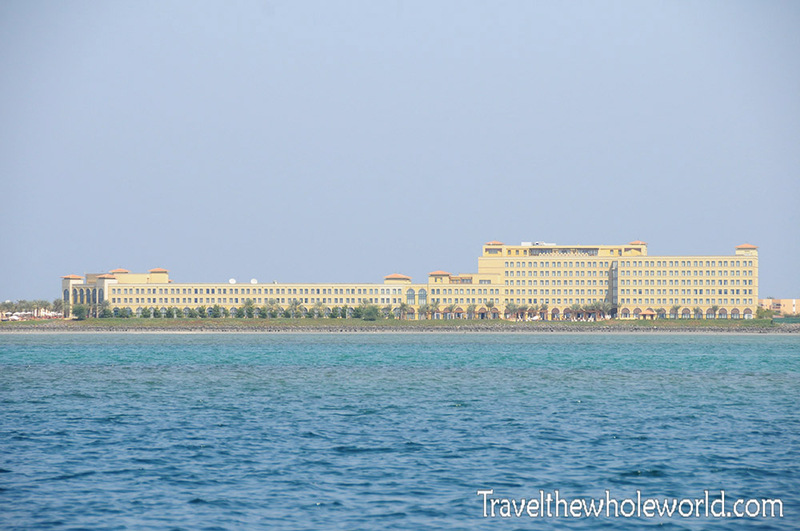 If you got more money than you know what to do with you’ll probably find yourself staying in the Kempinski Palace. The cheapest room you can find here is close to $500 a night! This 5 star hotel comes with all the luxuries you’d expect from a high class resort and you’ll likely completely forget you’re in Djibouti. I wanted to use the internet here but it was an atrocious $5 for 15 minutes! At least they didn’t charge anything to use their pool which my friend and I took advantage of. Had they known we weren’t guests, it might have cost us $100 an hour to swim here. 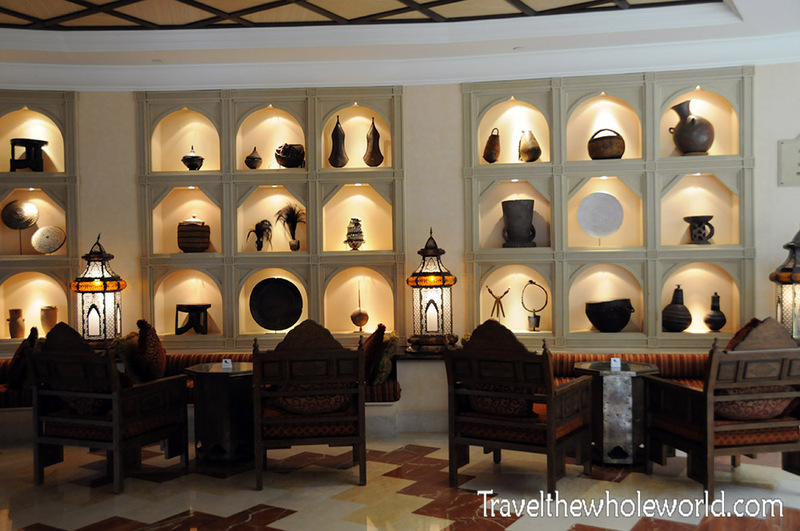 Within Djibouti City itself you can find a wide range of food and luxury. 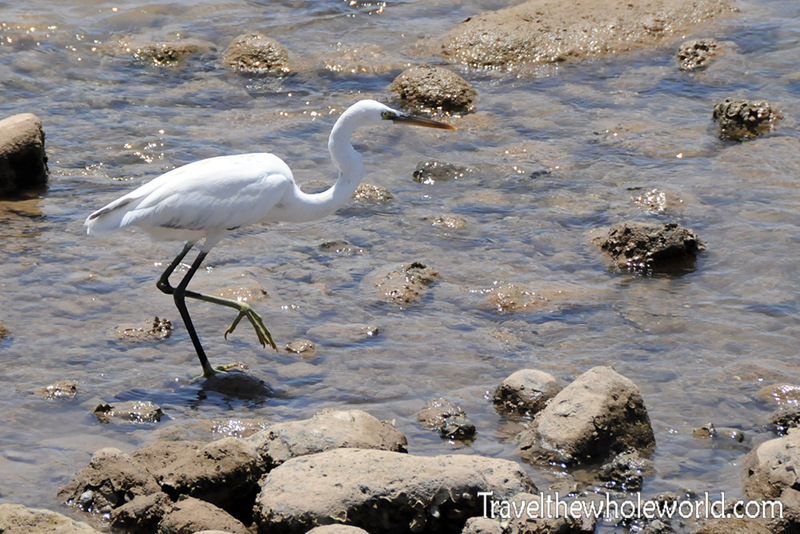 In regards to wildlife you’ll have to travel a bit outside the capital to see anything besides stray dogs and cats. 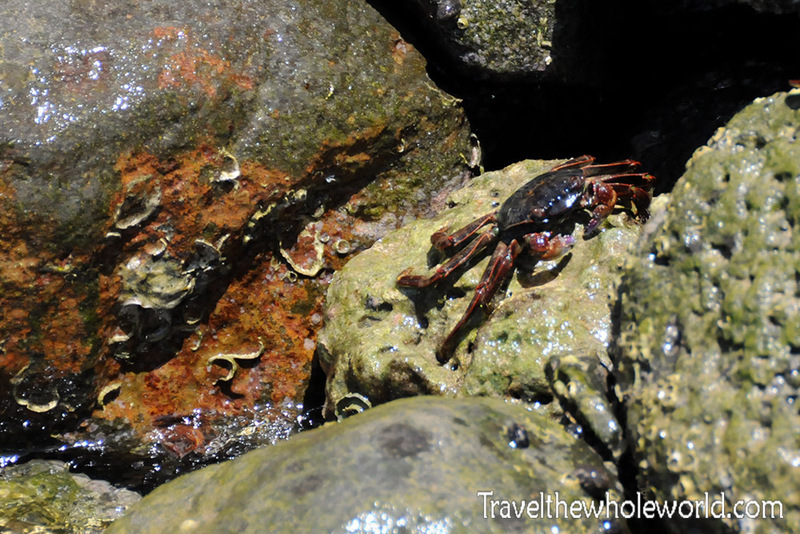 The only animals I saw consistently were several herons and crabs along the city’s coast. These two shots were actually taken right outside Kempinski Palace. When I return to Djibouti my priority will be to go to the Goda mountains. The Goda mountains are located at a higher altitude which brings much cooler temperatures that are more reasonable for wildlife. I’ve yet to see these mountains with my own eyes but my understanding is they are a rare haven of thick green vegetation that would normally be associated with a country like Rwanda or the Congo! 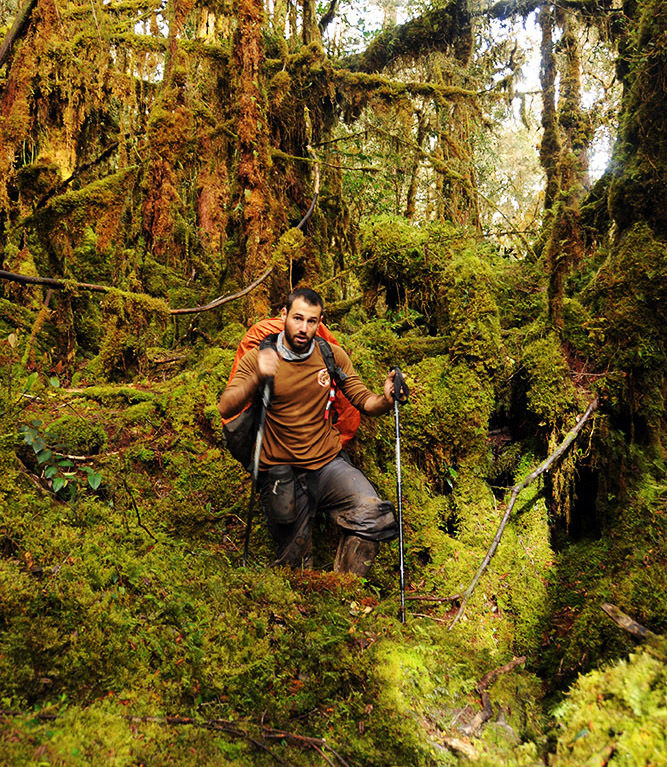 Some of the mountains rise up to over a mile in altitude or over 1,750 meters and is home to the country’s only national park. Next time! After Djibouti, my friend and I tried to visit Tadjoura, since this city was the former capital of Djibouti and has a lot to do it was high on my list. It’s separated by only 20 miles of water from Djibouti City so we figured we’d take the ferry along rather than the very long drive. We showed up too late to make the commercial ferry but we did find a small cargo ship carrying coca-cola who offered us a ride. Their English wasn’t so good but they gave us the impression they would be leaving soon. While we waited I even helped to carry a large box of coke onto the boat for them! Although they kept saying they’d be leaving very soon, it became obvious that this might be a few hours so we gave up on the idea. Instead of Tadjoura we ended up visiting the Moucha Islands. I’ll have to save Tajdoura for my return to Djibouti! 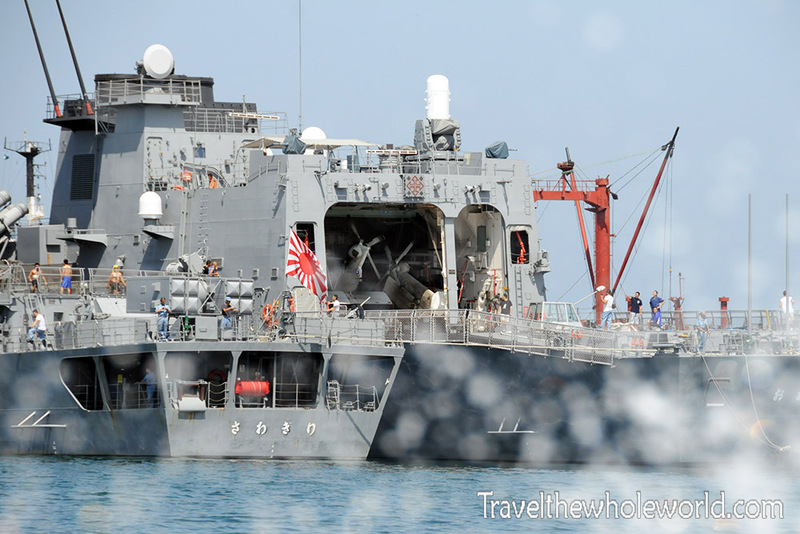 While riding the ferry out of capital’s port I passed by two Japanese naval war ships. I imagine they were here to help fight pirate’s off of Somalia’s coast. At the time of my visit, the pirates were at their peak as far as stealing ships and hostages. I find it interesting how safe Djibouti is but just south and east are some of the most dangerous and unstable regions on earth! Many of these countries that patrol these oceans take pit stops and breaks in Djibouti.